Barel Karsan - Value Investing: ITB: A Play on Real-Estate? We saw here that several home builders are trading at large discounts to their book values. However, for those who are unable take the time and go through individual builders, or who want to diversify across several builders, an ETF that tracks the S&P Homebuilder Index exists (symbol: XHB). 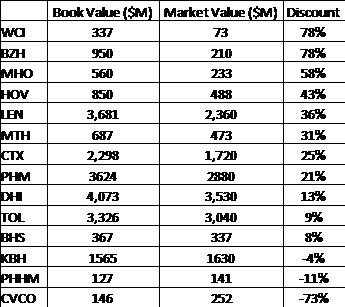 Unfortunately, because of XHB's holdings, as we discussed here, this is hardly a good play on the discounts to book value. Cavco (CVCO) actually managed a profit last quarter, which may help to explain their premium to book. The rest of the builders could offer some value, if markets have indeed overreacted to the downside (which we know they are prone to do, from this article).